Skylab was the United States' first space station-and much more. It was, of course, a complex and complete orbiting home and scientific laboratory, where nine highly trained astronauts lived and worked in teams of three in shirtsleeve comfort. But it was also a program of unparalleled scientific scope which continues to yield highly valuable information about the universe and life within it. Skylab was a comprehensive program of scientific experimentation that revealed heretofore unknown information about man's capability to withstand long periods of weightlessness, about the adaptability of other living creatures to the space environment, and about life itself. It produced a vast study of the Earth's crust; of the oceans and of life beneath their turbulent surfaces; of ranging mountains, lush forests, and desert wastelands; and of crops, weather, and changes in environment created by man. It permitted a revealing study of the great star Sun, unparalleled in scope and unmatched in results. It gave an intimate look into the universe, a firsthand study of comets, meteors, the planets, and the stars. It included a factory where men manufactured alloys, grew perfect crystals, and learned to work in space. 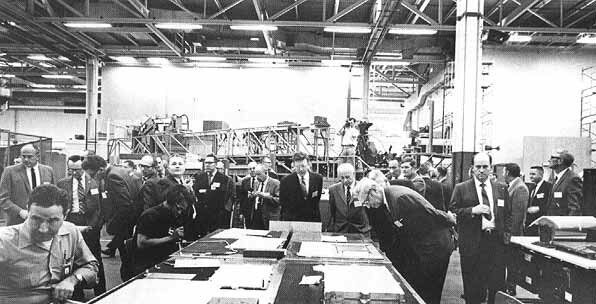 Involving scientists from 28 nations, Skylab demanded the highest degree of cooperative effort from the world's scientific community. Scientists, engineers, and technicians worked, observed, cataloged, and analyzed data on Earth while Skylab orbited overhead, its crew making related observations and scientific measurements or conducting experiments. And when their work was finished, this team was able to correlate the data obtained from both sources, thus refining the scientist's capability to more accurately observe and predict phenomena on Earth. Skylab was excitement, high adventure with all the drama that could be packed into its three manned flights, totaling nearly half a year. It was conquest, of manmade hardware, of difficult and challenging environment, and even of ideas. And it was a severe test of man's capability to analyze, solve problems, and make innovative repairs in a hostile and unforgiving environment. Skylab was ingenuity. The program was initiated with hardware developed for other programs, modified for this space odyssey, and supplemented by items designed specifically for the conduct of its unique mission. And Skylab was innovation. It was men challenging and overcoming the formidable obstacles placed in their path by malfunctioning equipment, refusing to bow to adversity, even in the face of great danger. It was the dogged determination of men to achieve their goal. This diagram shows the wings and the five major assemblies of Skylab: workshop, airlock, docking adapter, solar observatory, and command and service module. The Apollo command and service module was the logistics vehicle, docking at the forward end of the docking adapter, which housed many of the experiments and provided a docking port. The airlock connected the docking adapter and the workshop; the latter provided the living and working quarters for the crew. The solar observatory was mounted on a structure above the docking adapter. Two cutaway views of the orbital workshop showing details of the living and working quarters. ....program provided a vast amount of scientific data which scientists will be analyzing for many years. Five major assemblies, clustered together, made up the orbiting space station called Skylab. The largest of these was the orbital workshop, which housed the crew quarters and a major experiment area. The airlock module, attached to the forward end of the workshop, enabled crewmembers to make excursions outside Skylab, and the docking adapter, attached to the forward end of the airlock module, provided the docking port for the Apollo command and service module. The Apollo Telescope Mount (ATM) was the first manned astronomical observatory designed for solar research from Earth orbit. Together, the five assemblies weighed nearly 100 tons. Their volume was about that of a small three-bedroom house. Most of the usable volume was in the workshop, where the astronauts lived and worked. Four separate launches, one unmanned and three manned, were planned for the Skylab program. 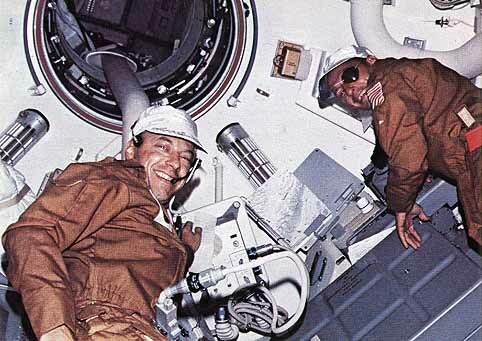 Initially, the manned missions were programed for 28, 56, and 56 days, respectively, but the second and third crews stayed longer than planned. This greatly enhanced the program's scientific value. 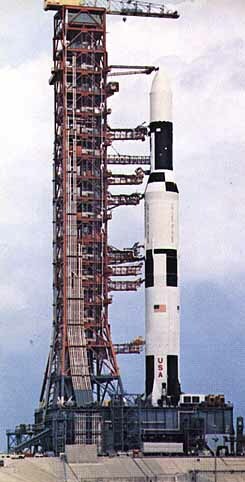 The Saturn V rocket stands poised on Pad A of Launch Complex 39 at the Kennedy Space Center. Its passenger was Skylab, our first space station. 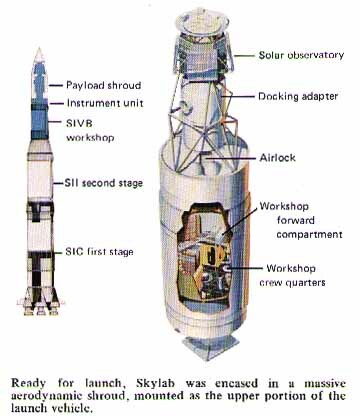 Plans called for launching the Skylab cluster, encased in its aerodynamic shroud, on a two-stage Saturn V launch vehicle. After arrival in orbit, with the shroud then jettisoned, the solar observatory would be rotated to face the Sun, and its solar array would be extended. Following this, the solar array of the workshop would be extended. Then the micrometeoroid shield, which fitted snugly around the workshop during launch, would be extended outward. This shield was designed not only to protect the workshop from micrometeoroids but it also provided protection from the powerful rays of the Sun, thus holding inside temperatures to a habitable level. The unexpected tearing off of this shield from the workshop shortly after launch and the damage to the workshop solar array created the drama marking the early days of Skylab. This mission sequence shows graphically how Skylab would be launched and deployed in space. ...would conduct experiments and evaluate the habitability of the vehicle, as well as their capability to live and work for long periods in the space environment. At the conclusion of their mission, they would prepare the cluster for unmanned operation, transfer to the command and service module, and return to Earth as they had on earlier Apollo missions. Some 60 days following the return of the first crew, a second crew of three astronauts would launch to rendezvous and dock with the orbiting vehicle. During this 56-day mission, they would carry out extensive work in solar astronomy and Earth resources observations. The third manned mission would begin about 30 days following the return of the second crew. Additional scientific experiments were to be performed, and further data were to be obtained on the crew's adaptability and performance in space. Skylab was designed to orbit 270 statute miles (235 nautical miles) above the Earth's surface where astronauts would conduct scientific observations in four broad categories. Skylab provided the flight crews and their scientific instruments an excellent view of Earth. Here, Astronauts Pete Conrad and Paul Weitz use the Earth resources optical equipment to study terrain features. The eye patch worn by Conrad is an aid to viewing. ....planned to determine the increments by which mission duration could safely be increased. Additional experiments and work assignments were planned to study man-machine relationships. 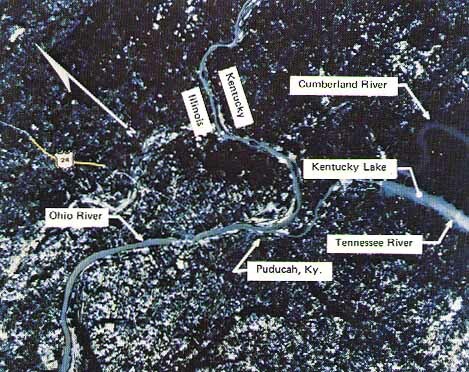 The purpose of these investigations was to develop and evaluate techniques using man for sensor operations, data selection and evaluation, manual control, maintenance and repair, assembly and setup, and mobility required for various operations. 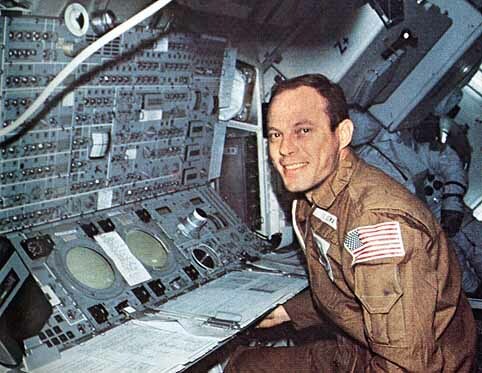 Continuous operation of Skylab systems over a prolonged period of time was designed to validate techniques for increasing system life, for supporting long periods of operations, and for maintaining control of the systems throughout the mission. Finally, experiments were conducted in solar astronomy, Earth resources, science, technology, and applications. Each experiment involved man when his contribution would improve the quality or the quantity of the data. Scientifically, Skylab was a bold beginning. It was the first long-term venture into the exploration of the universe from near-Earth space. It looked inward to Earth, outward to our Sun, and scanned the universe. Skylab was equivalent to a small, complex scientific community on Earth. It included equipment similar to that found in Earth-based radio and television stations; physics, biology, and manufacturing laboratories; photographic studios; and well-equipped astronomical observatories. Flying 50 degrees north and south of the Equator (a range approximately equal to the width of the band between Montreal in Canada and Cape Horn at the southern tip of South America), Skylab completed about 3900 orbits from launch to the end of the third manned visit, and flew over 75 percent of the Earth's surface, including 80 percent of the developed land and 90 percent of the total population. 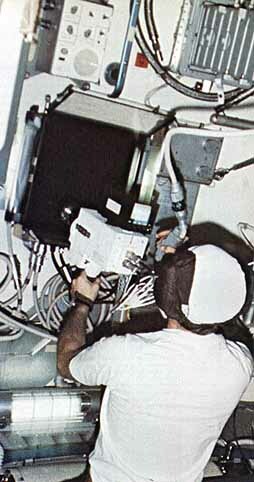 Seated at the control and display console in the docking adapter, the astronaut manually controlled many important operations, and monitored scientific observations. In this photograph, Jack Lousma of the second crew observes the Sun, watching for the appearance of solar flares. The astronaut's patience was rewarded late in the mission. ....gravity environment than had been anticipated, and to increase the benefits from the experiments being conducted, the second and third missions were extended to 59 days and 84 days, respectively. Skylab permitted a searching study of the planet Earth. ....skilled in carrying out scientific experiments and in maintaining Skylab equipment in an operational condition. Their manual adjustment of the space station controls, precise pointing of experiments, and their reasoning and judgment contributed greatly to the success of the scientific program. The Skylab solar experiment program provided much valuable data previously unavailable to the world's solar scientists. Solar images relayed to Earth by television, and photographic films of the Sun returned to Earth by the astronauts, portrayed the Sun as often violent, producing X-ray and ultraviolet emissions that cannot penetrate our atmosphere and, therefore, are never observed from Earth. Part of the long-term study of Skylab data includes analysis of solar activity as it affects the Earth's weather and communications. In time, Skylab's solar physics experiments may also lead to an understanding of new ways to generate power on Earth. From their orbital vantage point, Skylab sensors were able to search the heavens and near Earth to further man's knowledge of the universe. The sensors observed stellar and galactic targets in X-ray, ultraviolet, and visible light. Interplanetary dust was studied by observing reflected light and by measuring micrometeorite impact craters. 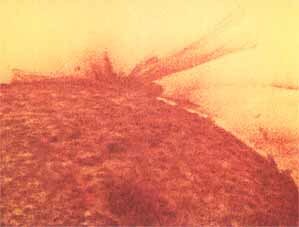 The passage of Comet Kohoutek was recorded by numerous sensors and vividly described by the crewmen. Energetic particles, like cosmic rays and the protons and electrons trapped in the Earth's Van Allen belts, were recorded by Skylab experiments. The physics of the Earth's upper atmosphere was studied, including observations of atmospheric airglow and ozone layers as well as the northern and southern lights. Measurements were made of the amount of contamination produced by Skylab and its effects on such critical spacecraft components as optical and thermal-control surfaces. Among the more important benefits of the Skylab program were those resulting from extensive studies conducted of the Earth. More than 140 scientific teams from the United States and 28 foreign countries united in one of the most exhaustive and most carefully coordinated scientific investigations ever undertaken of our home planet. Skylab's sensors continuously searched the Earth, gathering and recording valuable data. Fixed and hand-held cameras photographed surface features. Other instruments, recording on magnetic tape, measured reflections from plants, soils, and water. Radar made accurate measurements of land and water features, often in remote regions about which only sparse knowledge existed. Each of the studies conducted had a direct bearing on human life in the rapidly changing Earth environment. Meanwhile, ground-based crews made similar and simultaneous observations on Earth. Ground and orbital observations were later compared to provide a more accurate assessment of the validity of data from Skylab and future space observatories. The possibility of manufacturing or processing materials under near-zero-gravity conditions has long intrigued the materials engineer. On Earth, gravitational forces lead to thermal convections, sedimentation, buoyancy, segregation, and other effects which may be adverse to the formation of specific materials in which undisturbed lattice structures, homogeneous mixing, or extreme purity are of essence. A series of Skylab experiments was developed to evaluate the advantages of processing materials in space and to test the feasibility of larger scale space manufacturing. Results were highly favorable. Experiment objectives ranged from basic research to actual materials preparation. Scientists expect this program to benefit a multitude of disciplines, including basic materials science, communications, electronics, biological research, and construction in space. One of Skylab's interesting features was the Student Experiment Program. Here, Astronaut Owen Garriott televises the performance of the space spider, Arabella, as she adjusts to the weightless environment aboard the space station. ...-strate familiar scientific principles learned over the centuries. Fluid surface-tension phenomena and free-body inertial effects were demonstrated on television in Skylab's zero-gravity environment in ways that could not be duplicated on Earth. These student experiments and science demonstrations brought the phenomena of space into the classroom and the home. Some are recorded on film for further use. Mercury, Gemini, and Apollo flights were of sufficient duration to confirm that weightlessness causes biological changes in men, but they left unanswered such important questions as "How long can people live and perform efficiently in the space environment?" and "Can they readjust to Earth?" Skylab answers were conclusive; the adaptability of healthy men in the space environment for long periods substantially exceeded expectations. One of the Skylab's principal objectives was the continuing evaluation of man's fitness to live and work in space for long periods. Biomedical and behavioral experiments were conducted on all three manned periods. This space-age gravity tank tested the astronaut's cardiovascular system as it adapted to weightlessness. The tank created a partial vacuum, simulating the pull of gravity. This caused blood to pool in the legs, as on Earth. Sensors measured the ability of the heart to pump blood. ....had to operate and provide reliable life support for nearly 9 months. No previous U.S. manned spacecraft had used solar energy to generate all the electrical power needed for operation of its systems. Instrumentation for monitoring the condition of critical equipment required a high degree of accuracy. Pointing control of the solar observatory demanded a precision never before required on manned spacecraft. And closely regulated thermal and environmental control systems were vital to crew comfort and efficiency, experiment operation, and to the proper maintenance of food medicine, film, and other supplies. 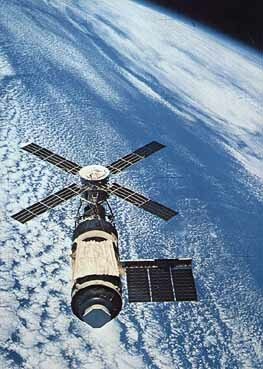 Skylab's lengthy manned periods required high system reliability coupled with a capability to make repairs in space. This was a new requirement for manned spaceflight, demanding a continuing close working relationship between ground specialists and flight crews throughout the mission. Living in space for long periods of time provided astronauts with interesting and often humorous problems, far different from those faced in our daily routine on Earth. And providing a home and workshop in which the astronauts could live and work comfortably was a design and integration challenge never faced before. Experience and knowledge gained from earlier space programs, along with years of hard work, resulted in the successful execution of one of the most ambitious scientific and engineering programs  ever undertaken. The full value of the immense amount of knowledge gained during this program will not be known for many years. Skylab's management scheme was no less innovative than its technical approach. Effective management had to be provided for the combined activities of several NASA centers, over a dozen major contractors, many scientific and educational institutions, other government agencies, and contributions, including experiment hardware, from foreign countries. Management had to insure balanced fiscal and schedule requirements with maximum scientific yield of a multidisciplined cargo of experiments, while integrating technical requirements for safe, reliable, and efficient operation of the Skylab. This was the Skylab management challenge. Headquarters in Washington, D.C. The George C. Marshall Space Flight Center (MSFC), Huntsville, Ala., was assigned responsibility for the development of the orbiting space station hardware as well as overall systems engineering and integration of the Skylab to assure the compatibility of the complete mission hardware for each flight. Planning and execution of mission control, flight operations, and adaptation of the Apollo command and service module was the responsibility of the Lyndon B. Johnson Space Center (JSC), Houston, Tex. Planning and execution of launch operations was the responsibility of the John F. Kennedy Space Center (KSC), Kennedy Space Center, Fla. Each center was prominent within its prescribed area in the highly integrated technical and management team formed to implement the Skylab program. Close continuous communication and the implementation of carefully planned and phased technical and management reviews which integrated the expertise of the various participants were an essential ingredient to bringing the program to its successful conclusion. Visitors to the neutral buoyancy simulator of the Marshall Space Flight Center, in November 1967, included top-level personnel from NASA Headquarters and several of its field centers. Left to right were Edgar M. Cortright, William E. Stoney, Robert F. Thompson, Kurt H. Debus, Edwin A. Weaver, Paul H. Schuerer, Charles W. Mathews, William R. Lucas, Wernher von Braun, George Hage, Robert R. Gilruth, Barney E. Evans, Hermann Weidner, George B. Hardy, Julian West, George S. Trimble, Thomas W. Morgan, Maxime A. Faget, and Robert F. Heiser. In March 1970, NASA center directors and their staff members visited the St. Louis facility of the McDonnell Douglas Astronautics Co. to review progress on Skylab. Left to right are Thompson, Christopher C. Kraft, Jr., Thomas W. Morgan, Faget, Ludie G. Richard (behind Faget), unidentified, Walter Burke, Sigurd A. Sjoberg, F. Brooks Moore, Eberhard Rees, Kenneth S. Kleinknecht, Lee B. James, T.J. Lee, Leland F. Belew, Floyd M. Drummond, and Fred A. Speer. 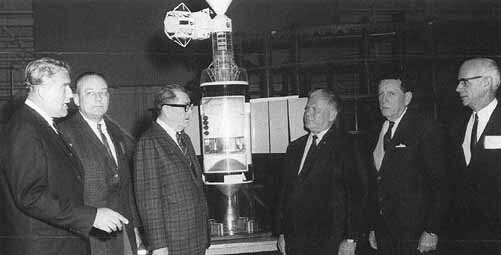 Inspecting launch facilities at the Kennedy Space Center early in the Skylab program are, left to right: von Braun, George E. Mueller, James C. Elms, Rep. Olin E. Teague (D-Texas), and Robert C. Seamans, Jr., facing away from the camera. Members of the Congressional Subcommittee on Manned Space Flight received a briefing on the Skylab program during a visit to the Marshall Space Flight Center in March 1969. Left to right: von Braun, Rep. Joe D. Waggoner, Jr. (D-Louisiana), Rep. Earle Cabell (D-Texas), Representative Teague (D-Texas), Rep. James G. Fulton (R-Pennsylvania), and Ernst Stuhlinger. Seldom in aerospace history has a major decision been as promptly and concisely recorded as with the sketch shown here. At a meeting at the Marshall Space Flight Center on August 19, 1966, George E. Mueller, NASA Associate Administrator for Manned Space Flight, used felt pen and poster paper to pin down the final conceptual layout for the budding space station's major elements. Gen. Davy Jones, first program director, added his initials and those of Dr. Mueller in the lower right corner.